Puneeth Rajkumar's Anjani Putra has made a fantastic collection at the Sandalwood box office on its first day. Puneeth Rajkumar and Rashmika Mandanna's Anjani Putra has got a fantastic start at the Sandalwood box office. On its first day, the Kannada movie has made a commendable business in the state. The film was released to a huge hype. "Cinegoers were keenly awaiting the release as Puneeth Rajkumar is returning after a blockbuster in the form of Raajakumara. The response to the advance booking was an indication of the film's good opening," says a trade source. The early estimation coming from the source indicates that Anjani Putra has minted over Rs 5 crore. "The collection was fantastic on the first day although the complete details of an area-wise break-up are yet to be revealed. 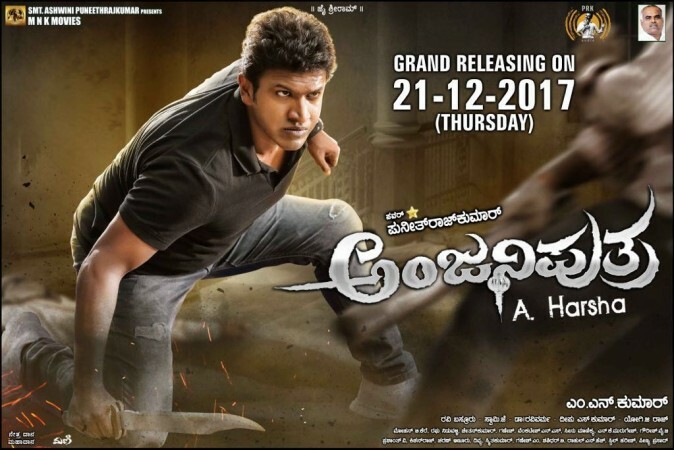 To be realistic, my estimation is the Puneeth Rajkumar's film would earn around Rs 13 crore share with a gross income of Rs 18 crore in the opening week," the source adds. This is likely to settle as Puneeth Rajkumar's second best film in terms of collection. With extended Christmas holiday, Anjani Putra is expected to set the box office on fire in the next few days. The good reviews from the critics and positive-review from the audience are expected to boost the business of the Kannada flick. Anjani Putra is a remake of Tamil flick Poojai. A Harsha of Bajrangi and Vajrakaya fame has directed the flick bankrolled by MN Kumar.